Easy camping recipes are just what they are - Easy Camping Meals!! You can fix a simple, delicious breakfast, lunch or supper out of just a few ingredients. The only problem you'll have is the time to try them all. One of the best things to have for easy meal cooking when camping is a roll of Heavy Duty aluminum foil and a can of spray oil. Those are the two most important things to have besides your ingredients. If you plan to go in a travel trailer, it is easier to fix these easy foil meals than if you go on a motorcycle camping trip or backpacking. Meals for those trips require special attention and are not as easy to prepare. An RV camper is the best way to go if you plan to eat more heavily. Having all your food items in one place and room to keep them all is a big help. Packing light means eating light. Camping in a tent is fairly simple. You just have to have more space to carry the needed things, like wood, food, coolers, clothing and personal things. Cooking over a campfire is the best way to cook easy meals when camping. It saves on using your propane for stove cooking. This also keeps you from making a mess in your camper. A refrigerator is ideal for those items that need to stay cool. A cooler works just as good, but it doesn't keep cool as long because you have to add ice every few hours. Remember meat needs to stay as cool as possible to be safe to eat. You can mix some of these easy camping recipes ahead of time and have them ready when you need them. Most will keep in the fridge for several hours before cooking and you will enjoy the time away from the kitchen. I have some easy camping recipes that are ideal for you to try. They are simple to make and takes very few ingredients. Some of these we've tried and others I've just gathered over time. You probably have some like that. Try them out and see how easy they are to do and then let us know what you changed to make them better for you. Create your own easy camping recipe using things you already have on hand. Keep in mind some of these may require hotter coals than others. Some will need longer time to cook than others. Keep your coals hot at all times. There are so many more different meats to cook over a campfire. I will share some of my recipes with you, but I would like for you to share back. If you will be so kind as to fill out the invitation below and send in your favorite camping recipe, we will share them with everyone. Your easy camping recipe will be posted live on the internet through our website. You will build a real page with your easy camping recipe on it. This easy camping meal is a no-brainer. Start with hot coals. Wash and scrub the potato with water. Using a fork, pierce the potato in several spots. Starting at one end of the potato, begin wrapping the bacon strips around it until you get to the other end. Tuck the edge of the bacon under the previous strip. Wrap the bacon wrapped potato in the heavy duty aluminum foil with the shiny side to the inside. Double wrap if possible. Lay them along the outside edge of the coals. Keep them turned often. You can check the doneness by opening the foil and sticking a fork or knife into the potato. If it is done, it will insert easily. Usually cooks in 1 hour, depending on the size of the potato you choose. You can also cook them over the grate of the campfire. It will take a little longer. You can also cook them in a crock pot. Prepare as directed, except put them in a crock pot. Let them cook about 6 hours. They will be a little brown in color, but are perfectly fine. This saves you some time when getting the rest of your meal together. Also, you can get them in there in the morning and have bacon baked potatoes for supper with no extra effort or time lost on preparation. Peel the onions and remove the top of them. Place each one on two pieces of Heavy Duty aluminum foil cut large enough to fully enclose the onion in. On the top of the onion where you cut off the top, put butter, sugar, salt and pepper. (You can add whatever you like) Double wrap loosely and place next to coals or on top of grate. Rotate every 5 minutes. Onions should be done in about 20 minutes. Open carefully, as steam will be hot. Serve with your choice of meat or just as it is. I've found this easy camping recipe to be a great side item for meat. Using a biscuit, start at the bottom and wrap it around the hot dog stick or dowel keeping it slightly overlapping as you go up. Hold over the fire, rotating it continually. It will cook to a golden brown. Be sure not to get it too hot too quick. You will have a burned outside and a gooey inside. The biscuit should be easy to remove. Fill the center with butter or whatever you want. Dip in jelly or syrup. How much more can this easy camping recipe be? Basically what you are making is an omelet in an bag. You choose what you want to add as a personal taste. Add all ingredients you want in your omelet. Seal the bag and mix all choices very well. Be sure the eggs are scrambled good. Remove all the air possible from the bag. Close the seal again. Place the bag with all ingredients in it into a pot of boiling water. Let it boil for 10 - 15 minutes or until done. Remove the bag when done, open the bag and slide it out onto a plate. This can be mixed ahead of time and refrigerated. It saves space on storing these extra ingredients in your fridge. It is an easy camping meal that your family will love to cook. We love this easy camping recipe! The grandkids love building their own. Mix the flour and creme soda together. Mix will be sticky. Drop spoonfuls into a well greased cast iron skillet. Put over campfire and let cook until done. Do not put directly over the fire as they will scorch on the bottom. Cooking time depends on the temperature of the heat. Check them often and move around as needed. Add your favorite biscuit toppers and eat! This easy camping recipe is very good and quick. 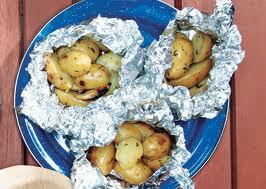 Using a large piece of heavy duty aluminum foil, place potato serving. Add your seasoning of choice. (It is best to leave the shredded cheese out until the fries are done). Add butter and mix all this together well. You can turn the foil over several times for even cooking. Top them with chili and cheese for extra flavor. The toppings are endless. You add whatever you like. Great easy camping meal for everyone! Mix the ground beef and other ingredients to your meatloaf liking. Roll into half dollar size balls. Using a skewer, layer a meatball, pearl onion and pepper ring. Cook on the grate over hot coals. You can also wrap your meatloaf in heavy duty aluminum foil and cook. Be sure to double wrap for surety of heat. Meat needs to be done before eating. Cooking this easy camping meal will smell up the campground! Place all your ingredients of choice on top of the tortilla. Keep it on one side. (You will fold it over on itself). Place on camping grill right over the grates above hot coals. Let it cook until cheese melts and center is hot. You can use the large tortillas and make a chicken quesadilla in a pizza form. Top with another large tortilla for the top. Cook in the same manner. Easy camping meal - done! Always use a heat resistant glove and a pair of long tongs to prevent burns. Never reach into the heat without any kind of flame retardant protection. Share your favorite camping recipe with us! Do you have a great camping recipe? I don't have many camping recipes to share, so I need your help. Share with us your camping recipes whether cooked in the camper or outside on the grill or over the open fire. We all need a new one to try, so let's hear about yours. What Is This Fabulous Dish Called? Sharing your favorite recipe is easy to do. Just type it in here and the world will be giving you KUDOS for it. Now is your time to shine. Add your favorite recipe and it will be posted live on the internet. You will have your own part of my website! Do you have a picture to add? Great! Click the button and find it on your computer. Then select it. We would love to ring the dinner bell for everyone to see what you've cooked up! Click here to open up the form and complete your recipe.